The Arms on the sheild above the couple, is the Harrington Knott. Note: The surname of Tyrrill is spelt many ways, on this page for the sake of continuity the surname is spelt as written on the monument, except for the family tree section. The Tyrrill family in Castlethorpe was descended form Sir Walter Tyrrill, alleged murderer of William Rufus, and Sir John Tyrrill [died 1437] who was MP for Essex in 1411 and 1413; present at the Battle of Agincourt, 1415; Sheriff 1423; Speaker of the House of Commons, 1427, 1431, & 1437; and Treasurer to Henry VI. Sir Thomas Tyrrell Bt was born on 23 June 1594, son of Sir Edward Tyrrill of Thornton Hall, Bucks. He was trained in the law and admitted to the Inner Temple in 1612, called to the Bar on 13 November 1621, and admitted as a Bencher in 1659. In the Civil War he fought on the parliamentarian side as a captain, and afterwards as a colonel, of horse under Bedford and Essex. He fought at the battle of Lostwithiel in 1644. He was deputy-lieutenant of Buckinghamshire in 1642; MP for Aylesbury 1659-60; joint Commissioner of the Great Seal, and Sergeant at Law 1659. He was knighted on 16 July 1660, and appointed Justice of the Court of Common Pleas on 27 July 1660, and placed on the commission for the trial of the regicides, although, apparently, taking no active part. In 1667 he was appointed one of 22 judges to serve on a court of summary jurisdiction to deal with cases arising from the ‘Great Fire’ of London, a task which took 6 years to complete. The City fathers, in gratitude for their work, commissioned Michael Wright to paint the portraits of all 22, and Thomas’ still hangs in the Inner Temple. He died on 8 March 1672, and is buried beside the high altar of the Church. He was granted the reversion of the lease of Hanslope alias Castlethorpe Manor in 1663, but had owned his house in Castlethorpe since 1626, although, it seems, because none of his children were baptised in Castlethorpe, [This house, in the castle precincts, exists today but never was the manor house. In the past it was known as ‘Castle Yard’. Part of it was pulled down in 1799.] He was married three times. His first wife was Frances [neé Saundes], widow of Richard Grenville of Wotton. There was a son of her first marriage, Richard Grenville, aged 6, who became High Sheriff of Buckinghamshire. By this marriage, Thomas appears to have had four children; Thomas, Peter, Elizabeth and Theodosia. He married his second wife, Jane, the widow of Colonel Windebank, at Hanslope Church on 22 February 1655, and by her had at least two children, James [baptised Castlethorpe 29 September 1655] and William baptised Castlethorpe 26 March 1657]. His third wife, who out lived him, and is buried with him in the Church, was Bridget, daughter of Sir Edward Harrington of Ridlington, Rutland. Thomas Tyrrill, the eldest son of Sir Thomas, apparently incurred his father’s displeasure and was disinherited in 1663: he married his cousin, Hester Tyrrill [her third marriage] of Thornton. Sir Thomas [baptised 8 April 1669 at Foscott, Buckingham] he inherited the house from his father; his children included Eyre [buried Castlethorpe 28 December 1698], Dorothy [baptised Castlethorpe 13 April 1702], Charlotte [buried Castlethorpe 18 May 1706], Cristobel and Harriet, the last two being his co-heiresses who sold the estate. Philip [buried Castlethorpe 29 April 1706]. 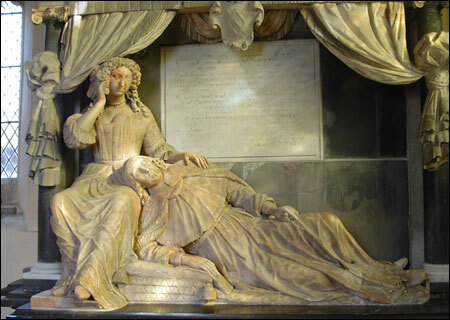 Susanna [buried Castlethorpe 15 May 1706]: Elizabeth: Francis: Ann. Theodosia Tyrrill married Francis Brereton of Co. Cheshire.